Gill: Let’s go to Rita in Nashville next – 737-9522, 737-WLAC – Rita, good morning. Rita: Good morning. I was calling to say I think it’s going to help the Republicans. I’m a black female and Trump was the first Republican I ever voted for and I just voted last week for Marsha Blackburn and Bill Lee – but my husband didn’t vote for Trump. But after he saw this caravan coming through, he all of a sudden switched from being a Democrat as well and he also voted for Marsha and Bill. So I think it’s going to help the Republicans. Gill: What was the turning point for you Rita? Why, again President Trump was saying to African-Americans, “What have you got to lose?” Did that impact you or where there other issues? Rita: It did, it did impact me. And I’ve been voting for Democrats, and I voted for Obama twice. And I didn’t see any changes. Like, Obama was more about trying to make people feel good. And it did make me mad that he was like we should be more welcoming to immigrants and the illegals. He just seemed like he came off like that. and like you know you need to take care of people at home. You shouldn’t be, I mean it’s ok for people to come, but they should come legally. All these people coming, I mean there’s a lot of people jumping over people trying to come legally. And then when they get here, most of them are uneducated. And they can’t speak English. I mean so that’s just a lot of money that’s going to be put into these people. To get them into our school system, because I live out on the South Side of Nashville, where a lot of people don’t see this, there a lot of Hispanics and people that have moved out there and their crowding the schools. And their crowding the schools on the South Side because there are so many out there. And they may you know a lot of the kids don’t speak English. You know, so I mean it’s going to take a lot to get included into America, you understand what I’m saying? Gill: And again, are they coming to be Americans? I mean when their singing the Guatemalan Anthem and waving their own flags. The same thing you see on these protest on the Mexican border when these illegal aliens from Mexico here in the United States, their wave their Mexican flag, and that’s fine you know and on St. Patrick’s day we’re all Irish. But it doesn’t effect how they embrace our culture, and I think as you point out, Rita, a lot of African-Americans are the one’s who are seeing these people take their jobs because they are able to charge less for their wages and be taken advantage of by employers who are using them rather than American workers. To me, one of the things President Trump is doing well is saying, are we going to put Americans first or illegals first? And the Democrats keep wanting to put the illegals first. 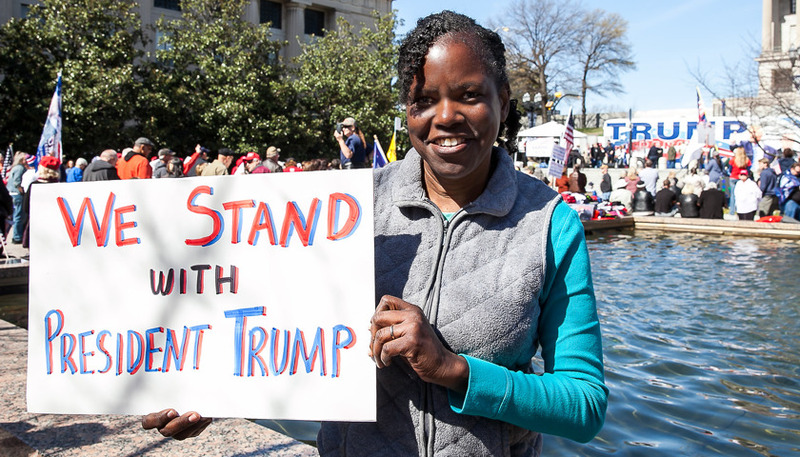 Photo “Trump Supporter” was taken at the Spirit of America Rally on March 4, 2017 by The Tennessee Star. This is another victim of gas lighting and lies. Y’all have pathetic heroes. Thank you Rita!! You are courageous not for supporting trump, but to do so amongst such animosity and hatred from the dems who can’t fathom to lose a voter. I want all Americans to succeed, and the best for them if they wish to earn it. Thank you Rita…and welcome to our President Trump’s Party! I believe in Trump. He is blunt right to the point. Not afraid to go after new ideas and the guts to face life on life’s terms no mater where or when he is the change this world needs to have the willingness to listen, slow down and do what it take to make crap work better for ALL the world to share and care. It may take a minute to see or understand the approach he uses but give him time and we will get out of the whole we dug for the way everyone only wants to see the poop. Let the man do what he dose best run this world back into existence.